Among the most delectable meals I’ve ever enjoyed was a roast jake turkey with a creamed morel-wine sauce, brewed up by Chef Don Thomas using wild ingredients he’d harvested himself. Every spring across much of America, in parallel with turkey season, foragers are blessed with the brief annual return of the exquisite morel mushroom, both black and blonde. Which of the two is best is a matter of individual taste, but few experienced fungus fanatics will disagree that morels provide the ultimate in wild fungal fare. Other edible mushrooms come a little later. Shaggy manes (aka inky caps) appear literally overnight and unpredictably, spring through late summer, standing white and erect along the hard-packed edges of unpaved forest roads and trails. They are excellent sliced very fresh (get ’em young and cook ’em quick, before they liquefy), dipped in an egg-milk batter, rolled in fresh grated parmesan cheese and sautéed in butter with a clove of freshly crushed garlic. White king boletes (Boletus barrowsii) make sporadic appearances all summer long, but in the mature stage are often spoiled by boring insect larvae. To preclude that bitter end, watch for telltale pregnancies where the needle duff is humped up, then gently scrape away the overburden and collect them young, tender and bug-free. In late summer and early fall–elk season in the high country–golden chanterelles cluster on damp, shady, north- and east-facing slopes in mossy conifer/aspen forests in upper montane and lower subalpine ecosystems. They resemble corals and smell like apricots. Yet morels remain the favorites among most mushroom fans everywhere, as evidenced by their gold-scale retail value. Yet they come to the sharp-eyed forager as gifts of nature. As a bonus, confusing morels with any of the several so-called “false” morels takes some doing, as all the falsies I’m aware of resemble lumpy, deformed brains, in no way imitating the morel’s attractive conical sponge. In flavor as well as texture, whether fresh or dried, morels are prime-cut meaty and the perfect compliment for elk, turkey, and other wild flesh, blended in a gravy sauce or simply sautéed in garlic butter. A few per serving is plenty, as they are extremely rich and filling. For long-term storage, morels must be thoroughly dried as rapidly as possible after washing, and stored in the proverbial “cool, dry place” away from direct sunlight. While some collectors use zip-lock bags for long-term storage, my wife and I prefer tightly lidded canning jars. Thus coddled, well-dried morels require no refrigeration (although it doesn’t hurt) and will keep well for a year or more. Later, rehydrated for an hour or so in lukewarm liquid–water, milk, or red wine, depending on intended use–they emulate the sponges they resemble and plump right back up to full size. But there’s a whole lot more to the charm of morels than even their prime-meat flavor–namely, the thrill of the hunt itself. 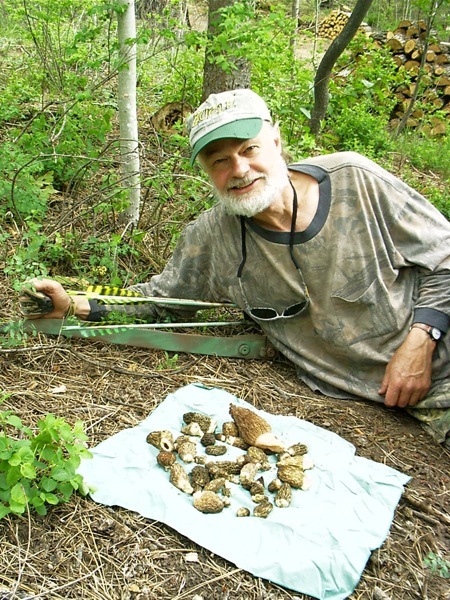 The post A Fungus Among Us — Mushroom Hunting appeared first on Traditional Bowhunter Magazine.